Garnet "Ace" Bailey and Mark Bavis were Los Angeles Kings scouts who were aboard United Flight 175 when it crashed into the South Tower of the World Trade Center on September 11, 2001. 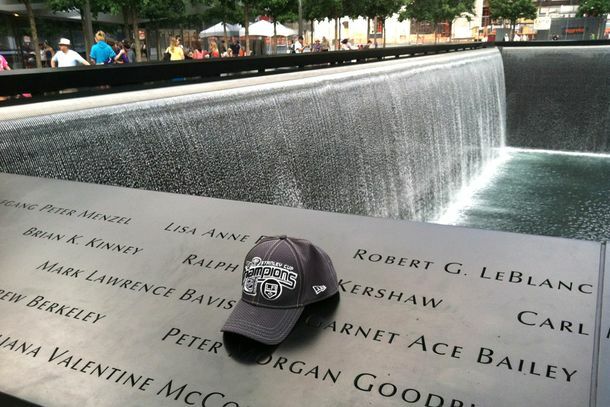 And so, after the Kings won the Stanley Cup this week, a fan of the team who lists his name as Dave Krasne on Twitter paid tribute to the two by leaving a 2012 Stanley Cup champions hat by their names at the 9/11 Memorial downtown. Said Krasne on Twitter: "as a kings fan in NYC, I couldn't let Mark Bavis or Ace Bailey miss the festivities."